Twice Dead is a new instalment in the Lieutenant Beadry series. I have read and reviewed both of Michael Kent’s previous stories, Blood Tail and Folded Dreams. I enjoyed this book just as much as the previous two. Lt Beaudry is on the hunt for a serial killer in Montreal’s gay village. The narcotics squad is also investigating a new drug that puts them on the same trail. Beaudry is “on loan” to the narcotics folks through most of this story. 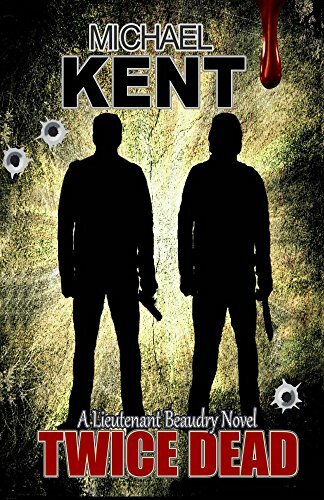 Michael Kent has crafted another easy to read, fast paced story with Twice Dead. I zoomed through it in about 4 days. I do have to say that 2 of those days were during my background acting week, where I sat around and read for parts of the day. But even so it would have been at week at most if I’d been reading at home. The story is not long, but there’s a lot of body to the writing. It was fun to read more about Beaudry and his girlfriend, Pat, who we met in Folded Dreams. Their chemistry is a lot of fun. I would have been happy to read a few more scenes with them together, but really the story didn’t need it. I really enjoy Michael Kent’s writing. I’m glad he has me on his “reviewer” list – I didn’t even ask for this book and it arrived at my home for me to read at my leisure. Michael told me I didn’t even need to review it – it was just a gift for me as thanks for reviewing his previous novels. Of course I would review it though! I hope we can work together again the future. I did add Michael to my Brand Ambassador list – meaning we will continue to work together for mutual benefit. If you are interested in having me review your writing, please do contact me! My only caveats are: I need a physical book; and I usually have at least 5 books in a stack waiting to be read, so my reviews don’t get done immediately upon receiving a book. I’m always happy to connect with new authors! Thank you for your very professional review. I enjoy and learn so much from them. Thanks Darlene – I appreciate you leaving me a comment when you stop by!